Warning: keep an eye on Typhoon Halong heading to Japan. What we call hurricanes are called typhoons when a cyclone intensifies in the Pacific Ocean. Why should this matter to anyone except the Japanese? I’m glad I asked. 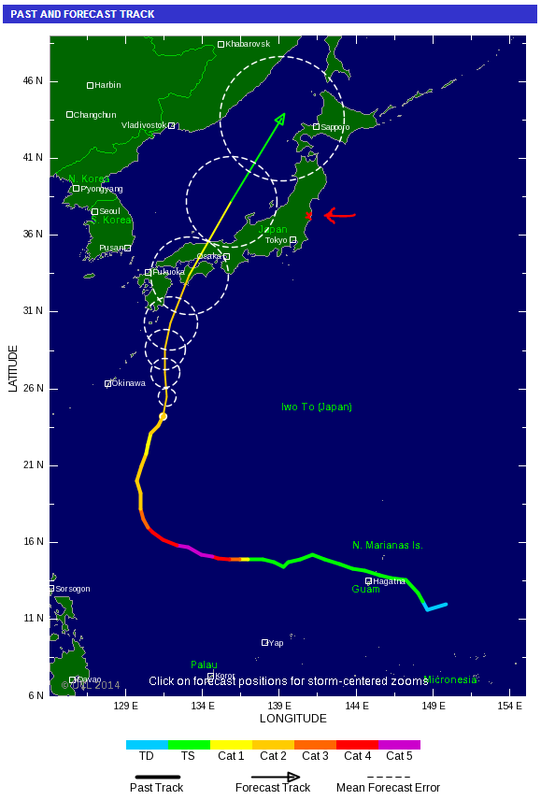 It’s because Typhoon Halong was originally forecast to track away from Japan and toward Korea far from the never-ending Fukushima nuclear disaster on the east coast of Japan. I’ve written much about the Fukushima nuclear disaster over the last two years that you can read HERE. Long story short: The Tokyo Electric Power Company (TEPCO) that ran the six unit nuclear power generators is a most incredibly incompetent organization. To call them an organization is an insult to chaos. They couldn’t run a lemonade stand. Not only were they in charge when disaster struck, but they’re in charge of cleaning up the mess which is expected to take decades or more and they cannot do anything right. I took one look at the typhoon’s forecast track last weekend and knew something was wrong. There was no allowance made for the prevailing easterly winds that I would expect would push the typhoon in a counter clockwise direction toward Fukushima on the Japanese northeast coast. For the last four days the storm’s forecast track has moved steadily further east. The forecast below shows the past track with a thick line and the forecast with a thin line. Fukushima is shown with a red ‘X’. If the track of the Typhoon continues moving eastwards, then Typhoon Halong is headed straight toward Fukushima. TEPCO couldn’t run nuclear power plants. TEPCO can’t clean up the nuclear disaster. TEPCO can’t keep the disaster from getting worse. Now, do you really think TEPCO can deal with a typhoon? The typhoon’s strength is forecast to be a Category 2 with winds 154-177 KPH or 96-110 MPH. Fukushima is likely to get hit with offshore high winds and an accompanying storm surge. The last thing TEPCO and the unstable buildings at Fukushima need is rising water caused by a storm surge and high winds with corrosive salt spray. Given that TEPCO has done nothing else right, do you expect them to properly prepare for a devastating typhoon? In all fairness, there isn’t much they can do. The buildings are already unstable, tilting, exposed and very vulnerable. There isn’t time to move hundreds of makeshift contaminated water storage tanks. And, they can’t stop the typhoon. This looks like another disaster in the offing. b) High winds could topple one or more of the six buildings some of which still house tons of fuel rods immersed in pools of water which will burn when exposed to air. It’s unlikely to cause nuclear fission but an incredible amount of contaminated smoke, particles and debris would be released into the air. Care to guess which way the wind blows? c) Emergency workers may need to be evacuated. With no one at site to maintain water levels in the fuel pools, the remaining fuel rods would be exposed to the air and also catch fire. I will continue to monitor Typhoon Halong. Given the news black-out and continuing cover-up for the last two years, don’t expect the authorities to warn you of any disaster nor are you likely to see anything on TV as that would cut into air time about important things like the Kardashians and home renovations. There are ways to mitigate your health risks from another nuclear disaster. I wrote about them HERE. If you haven’t already done so, consider subscribing to this blog (it’s free) on the upper right corner of the Home page and you’ll automatically be notified by email whenever there’s a new post. Updated Aug 7 with deletion of ‘clockwise / counterclockwise’ error as it’s not germane to this discussion. This entry was posted in Nuclear Disaster Japan and tagged Fukushima, nuclear, radioactivity, TEPCO, Typhoon Halong. Bookmark the permalink.